M25 Greater London clockwise severe disruption, at J28 for A12 affecting J27 for M11. M25 Greater London - Slow traffic on M25 clockwise at J28, A12 (Brook Street Roundabout), because of an earlier broken down vehicle. Congestion to J27 M11. 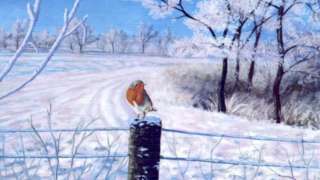 There's a warning that snow could fall in the Eastern region this weekend. In Northamptonshire, it's expected tonight. The Met Office says snow may fall in Norfolk and Northants on Saturday, as "one or two snow showers are possible in the west." On Sunday snow is predicted for the rest of the East. Police believe Paul Robertson was one of a group of armed people who tried to burgle the launderette. A13 Essex eastbound severe accident, at A132 South Mayne affecting A1012. A13 Essex - A13 in Pitsea blocked, stationary traffic and long delays eastbound at Pitsea Flyover, because of an accident involving two vehicles. Congestion to the A1012 junction. Tendring District Council says it is considering what action to take after a Christmas attraction continued to operate despite the authority telling it to close down. Christmas Wonderland, which is in a garden centre in Earl's Hall Drive, was shut because of concerns about traffic congestion having a negative impact on road safety. On Thursday, its bosses said it was open again for business despite the temporary stop notice. "The council is currently considering what action to take," a spokesman for the local authority said. Essex Police says the man died at the scene after being involved in a collision with a bin lorry. The anonymous card has appeared on the matron's desk at Stamford Hospital every year since 1960. 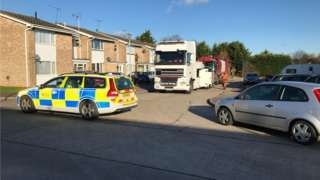 A man has died after a collision involving a bin lorry in Chelmsford, police say. Officers were called at 09:05 this morning to Osea Way, where the man died at the scene. 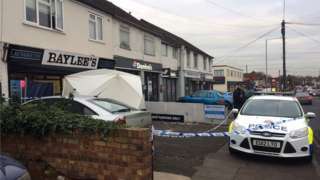 Essex Police said the Health and Safety Executive was at the scene alongside Chelmsford City Council. 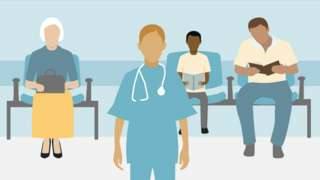 A mother dying from breast cancer has set up a campaign to expand a screening programme. M11 Essex southbound severe disruption, between J5 for A1168 and J4 for A406. M11 Essex - Stationary traffic on M11 southbound between J5, A1168 (Loughton) and J4, A406 (Woodford), because of a broken down car and all traffic being temporarily held. University student Averil Hart's family said she starved herself to death in 10 weeks. A woman in her 80s had her licence revoked as a result of the dashcam footage being given to police. A1124 Essex both ways severe accident, around The Street. A1124 Essex - A1124 Colchester Road in Wakes Colne closed and queuing traffic in both directions around The Street junction, because of an accident involving one vehicle. A Christmas attraction in Clacton, which had been closed down by Tendring District Council, has reopened again today, its bosses say. The local authority issued the attraction with a stop notice, but organisers say it's fully open today - adding on the attraction's Facebook page that they were "overwhelmed" by the support they'd received. 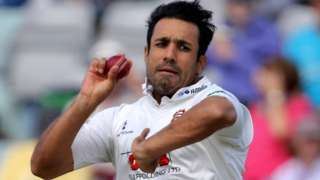 All-rounder Ravi Bopara renews his contract until the end of next season at county champions Essex. M11 Essex northbound severe disruption, after J6 for M25 affecting J5 for A1168. M11 Essex - Queuing traffic on M11 northbound after J6 M25, because of an earlier broken down vehicle. All lanes have been re-opened. Congestion to J5, A1168 (Loughton). The East of England Co-op says it is putting more stringent measures in place to try to deter ram-raiders from targeting its stores. Joint chief executive Roger Grosvenor said: "We've upped our patrols, and we're looking to put in place more bollards at the front of our stores." Mr Grosvenor was speaking after a white Citroen Berlingo van was reversed into the front of the Great Cornard store last night, but the raiders then abandoned it after it became stuck in the shutters. "We're most fortunate, we've got our own security firm so we were able to respond very quickly, as did the police," he said. There were two ram-raids at East of England Co-op stores last month, in Long Melford and Halstead, and one earlier this week at a Central England Co-operative in Rickinghall. M25 Essex clockwise severe accident, between J27 for M11 and J28 for A12. M25 Essex - Two lanes closed and slow traffic on M25 clockwise between J27 M11 and J28, A12 (Brook Street Roundabout), because of an accident. M25 Essex clockwise severe accident, at J27 for M11 affecting J26 for A121. M25 Essex - Queuing traffic on M25 clockwise at J27 M11, because of an accident earlier on. All lanes have been re-opened. Congestion to J26, A121 (Waltham Abbey).